Sometimes innovations come about when a customer gives feedback, sometimes they come about when someone within the company has a great idea. But in this case, an innovation seems to have come about thanks to a viral video that was viewed millions of times. 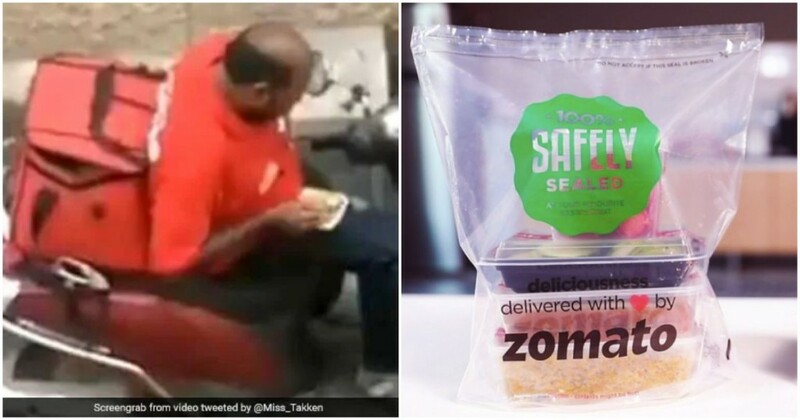 Zomato has introduced tamper proof packaging for its food deliveries, months after a video surfaced which showed its delivery executive eating an order en-route to its destination. On 11th December, a Zomato delivery executive from Mysore had been taped stopping his scooter, reaching into his bag and taking out a food order before partially eating it. He’d then repackaged the container and put it back into his bag. The video had promptly gone viral, prompting Zomato to announce that it would take precautionary measures to make sure such incidents weren’t repeated. Zomato has now said that it’s gone ahead and done exactly that. Zomato has introduced something called Zomato Safety Sealed, which are transparent plastic bags which will contain food orders. These bags have a seal, and a printed message which says “Do not accept if seal is broken.” The seal can be opened only once, which means that customers receiving orders in the new bags will know that their food hasn’t been tampered en-route. “These sealed packages will come in two sizes: small and large,” says Zomato on its blog. “The large ones are capable of carrying 2-4 large boxes while the smaller ones are convenient for 1-2 food item boxes. The versatility of the packaging design allows for efficient utilization of the space,” it adds. Zomato says it has piloted the project in 10 cities, and already has 5000 restaurants on board. By April, Zomato says it will introduce this packaging to 25 more cities. Given how Zomato has its restaurant-listing platform as well, it will also use it to prominently mention if the food delivered from a particular restaurant will come in the Safety Sealed bags. This could help bring more restaurants on board with the initiative, and also let customers choose restaurants which provide these bags for deliveries. There will, however, be the thorny issue of the increasing use of plastic — food deliveries already use lots of plastic that stays on in the environment forever, and these bags will only add to the overall plastic footprint. But Zomato says that its packages are reusable and recyclable, and it’s looking at biodegradable options going forward. Even more interesting will be the question of pricing — Zomato’s post doesn’t clarify who’ll bear the cost of these bags. If restaurants — or Zomato –decide to pass on the costs of the bags to customers, it could mean more expensive deliveries in the form of higher packing charges. But Zomato clearly thinks that the problem of food being tampered with during deliveries is large enough, and has devised a solution that’ll fix it at scale. Time alone will tell, though, if Zomato’s tamper proof bags will become an industry standard, or be seen as an expense that delivery companies can do without.